"Burnt Stub" china was used in the Zoo's restaurant and dining rooms, which were situated in the Burnt Stub Mansion. 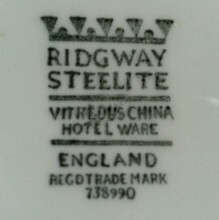 The china was produced for the Zoo by Royal Doulton / Ridgway Steelite and has the zoo's old trademark of a chimpanzee with the words 'Burnt Stub' eitherside of it, along with Chessington Zoo below. Also, below the chimp on some pieces are the words ' Devon Zoo & Circus, Paignton' as most of the Zoo was relocated to Paington during the 2nd World War. My collection started back in 1998, when I was working at Chessington as a keeper and came across a small dish in a local second hand/antique shop. Since then I have continuously searched for additional items and now have a collection of over fifty pieces, along with various other related items from the Burnt Stub including an original restaurant menu card and various match books. 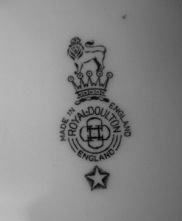 This photograph was kindly sent to me by a member of the Goddard family... in the photograph; Reginald is pictured holding a large cup and saucers which was made by Royal Doulton and used in the Burnt Stub dining rooms.